As a Young Adult writer, and even more as a writer of diverse fantasy, I consider myself a fairly open-minded human. Creating a world where teens are able to break down barriers, conquer adversaries, and challenge the status quo, is an important part of my writing life. The question of gender roles is one I must examine without prejudice, and even more, I must be alert to what teenagers are saying on the subject. Listening, writers are always listening. We have to hear in order to tell the story accurately. So when my nephew, Benny (Ben J. 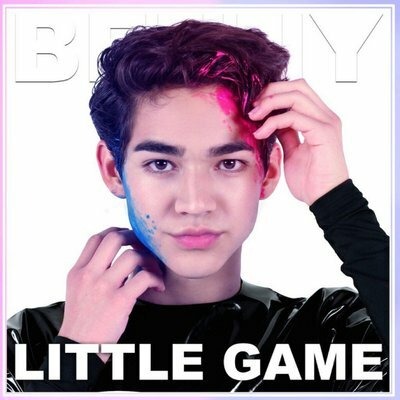 Pierce) a 15-year-old actor with his own YouTube channel and ever-growing following on Twitter and Instagram, debuted his first single Little Game, I paid attention. *Note: I am always paying attention to what my nephew produces. I cast him in his first stage play, I knew when he was nine he was going to be something fabulous. A few weeks ago, on his show KidPOV, he tackled a touchy subject for a teenage boy (for anyone, really, because hot button issues tend to make people stupid and use nasty emoticons): sexism in the media. It was thoughtful. It was generous. It was nicer than I would have been. Ben is not your typical boy. He never has been. So it came as no surprise to me that for his first single he chose to address the pressure placed on young men and women, boys and girls, to conform to societal norms regardless of desire or proclivity. As a female who always liked dresses and dolls and boys, who was a princess who sipped tea from china, I wasn’t picked on as a kid. But the sweet-faced blonde girl with red patent leather shoes also liked to give bullies bloody noses, and bullies learned to stay away. They learned to stay away from friends and siblings, too. But it’s cute to be a curly haired tomboy with a crush on Christian Bale in Newsies…when you’re a girl. Reverse this quirk to a boy who would rather tap dance than play football, and regardless of open-mindedness, no matter the change in times, certain names are used. With the pervasiveness of online bullying, these names become a permanent fixture in social media. As we get older, we are expected to exchange childhood whims for more decidedly adult ones. We are expected to get in line with everyone else, and if we don’t, we are labeled. These labels are damaging. As a teenager, still very much forming who you are and what you want, still trying to wade through all your desires and curiosities, putting a word to a way of feeling or thinking can alter self-image and create self-hatred in a way that becomes irreversible. But not always factual. Not necessarily a true representation of who you are. Say you are a thirteen-year-old girl who has always played sports, never wears make-up, doesn’t talk about boys you like because all the boys you know are either your friends, or gross. Say someone calls you a dyke. Tells you, you must like girls because of how you look, because you don’t talk about boys. Say you question yourself, and you discover no, you aren’t gay, but no matter what you say everyone still wants to label you that way. And because you are labeled that way, you are treated differently. You are side-eyed. Or maybe you discover you are. And maybe you don’t want to talk about it yet. Another person’s label cannot dictate who we are. There is no way to silence voices against you when voices want to be heard. There is no way to make everyone see you for who you truly are without bringing their own preconceived ideas into the mix. The need for acceptance is basic. It is human. Only a few opinions really matter. Ignore the rest. Getting to that point, though, not so easy. Videos like Little Game, Young Adult literature written for and about teens, talking about these things honestly, helps. I am not the only one that thinks Ben’s single is worth discussing. This week Buzzfeed picked up the story, and linked to the video. That, combined with others popular in the YouTube world speaking out in favor of his video, the views have jumped to (as of posting) 292,000 views. Ben is not the first to speak this message, as the article notes, and he won’t be the last. Ben is a teen, speaking to teens, about what it means to be a teen. I am an adult who is listening. Blue Lily, Lily Blue: Why Maggie Stiefvater’s Writing is Special to Me. Reblogged this on Stephanie Scott. People can be such jerks. Great song. Thanks for sharing.